Leaving Nydri in our modern air-conditioned coach, we travel along the east coast to the main town of Lefkas. Catch the hustle and bustle of busy centre and join the locals doing their shopping or explore the narrow side-streets. Next stop is the archeological museum, where many of the artifacts found by Dorpheld and Schliemann in their quest to discover the truth about Odysseus can be seen. Now we take the north coastal road, stopping at Faneromeni, the famous healing monastery. Many pilgrims come here throughout year, leaving the names of those to be prayed for. There is also an excellent museum which is free and well worth a visit. Onwards to the west coast with its stunning scenery of mountains and beaches which will truly amaze you. Here at Kathisma beach we stop for lunch. You will be free to use one of the snack bars or well-known restaurant and also have time for a swim in one of the pools or the sea and/or relax on the sand or a sun bed. 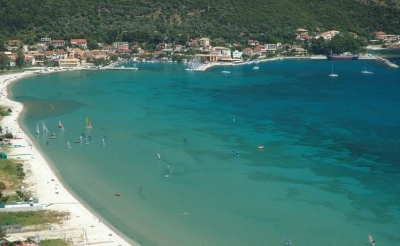 Our journey continues south to Vasiliki, the famous windsurfing beach. Explore the quaint traditional fishing village or relax in a cafeteria by the harbour. As we drive along the south coast, you will have views of the resorts of Sivota and Mikros Yallos. Finally, we stop at the winery where you can sample some local wines, see how they are made and perhaps make a purchase to enjoy on your balcony later.